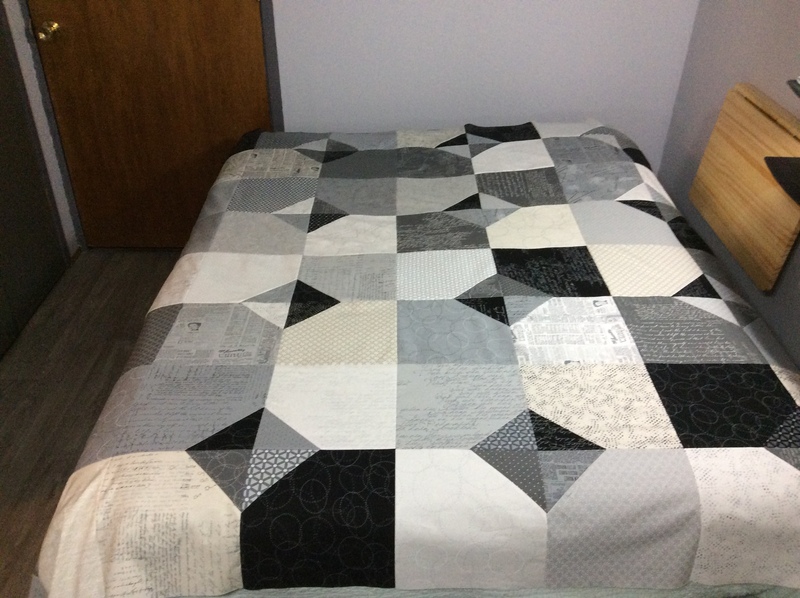 I made my quilt larger than the pattern by adding an extra row and column of blocks and opted for a random design, so that I could get this quilt top quickly made. (Almost all of the first column is hanging off the left side of the bed in the above pic). I will definitely make this pattern again if I need another quick finish. Just this morning I filled out a Quilter Needs Longarm Services form (link on Carole’s post) and hope to send off this quilt top and backing (black Carolyn Friedlander Widescreen) on Monday. This entry was posted in Uncategorized and tagged Carolina Hurricane Quilt Project, DrEAMi Moment. Bookmark the permalink. It’s wonderful!! Such a great quick quilt, and yours will surely be loved and cherished. It looks so good in modern paper! Thanks for the shout out! That is a nice quilt. I like the combination of neutral colors! What a caring and generous squirrel to chase, Mary! The quilt is surely going to be deeply appreciated and loved. I love this quilt top! What a great choice — I used almost every inch of a jollybar of this fabric. It’s one of my favorite neutrals ever. I think it’s especially terrific that you are sharing your work in such meaningful ways. I have clients who have family and friends in North Carolina who were impacted by the hurricane, and have heard stories of people losing anything or everything – knowing someone in that situation will be receiving your quilt feels like I’m witnessing magic. It might not feel or seem like such an epic feat but the more I hear the stories of others’ hardships in my work setting, the more I appreciate how humans at our best can be so caring in heart and deed. Sometimes our ability to be kind seems contrary to so many other aspects of what makes us human. So thank you Mary for spreading that light in the world, and quilting communities that coordinate such efforts of kindness. Wow! This quilt is really fabulous, and good to know it was such a quick make! Yay for the squirrels that are going to such worthwhile (though sad) causes. Thanks also for the link to Kitty’s, you are right how awesome it is! Thank you for linking up a quintessential DrEAMi! project! I find it hard to make gender-neutral quilts. Good for you for making more than one. This latest gender-neutral finish is 100% fabulous!